Albion Cornerstone Bank sponsored its $3 for 3 Points promotion again during the 2013-14 high school basketball season – and it was once again lucrative for the Cardinals! 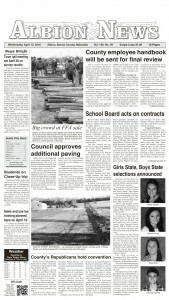 The Boone Central/Newman Grove varsity girls’ and boys’ teams combined to sink 245 3-point baskets (151 boys, 94 girls) during their campaigns, leading to a donation of $735 from Cornerstone Bank to the Cardinal Athletic Department. 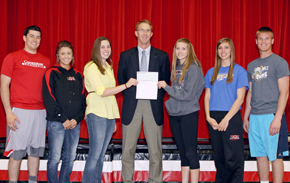 BC/NG athletes shown receiving the 2013-14 check from Todd Kramer of Cornerstone Bank are, from left, Tyler Hedlund, Megan Nelson, Alaina Rast, (Kramer), Jade Gottier, Miranda Ketteler and Derek Gentrup.